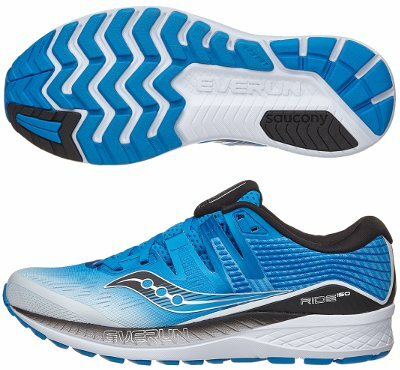 Saucony Ride ISO are neutral cushioned running shoes. It was strange not to see the ISOFIT system in one of the most popular Saucony running shoes, but finally Saucony Ride ISO has fixed it. So theorical Ride 11 replaces edition number with ISO buzzword in its commercial name so it is clear for everyone what can be expected. It has taken long time (4 years) since Saucony released its first ISOFIT running shoe, but it has been refined over the years and after successful feedback from its bigger sibling Triumph ISO 4, it is the right time for current Ride ISO. Original spirit remains the same for the "go-to-shoe" from the american brand, a great choice for neutral runners looking for a good balance between cushioning and response with 8 mm drop. Major change from its predecessor Ride 10 takes place in upper featuring mentioned ISOFIT system very well integrated to provide a secure and adaptive fit without interferences neither stiffness. It is interesting how ISOFIT technology has been developed over the last 4 years and the positive influence (and definitely turning point) of the outstanding Freedom ISO. Rest of Saucony Ride ISO remains very similar with same midsole configuration based on PWRFOAM™ with EVERUN™ layer on top of it for improved response, a comparable solution used in its counterpart with pronation support Guide ISO. Both foams together with sockliner it what Saucony names FormFit, the way the running shoe adapts to each user for better performance. Despite minor lug pattern changes, outsole keeps usual TRI-FLEX configuration to promote flexibility and smooth transition. Materials confirm great work and remain unchanged using lightweight and flexible (IBR+) in the forefoot to enhance cushioning while more durable carbon rubber (XT-900) is used in more exposed areas to increase durability.